A coloring book page found in the Maddox Ark. The Maddox Ark was uncovered on April 30th, 1998 by a construction crew building the Rancho Cerritos subdivision in El Cajon, California. Workers struck the Ark as they backfilled the foundation of what later became 1720 Chapparal Court. The discovery of the Alhambra Ark in nearby Santee, California, the previous year had heightened local interest in Ark finds, spurring weekend arkologists to hunt for other artifacts.a Once notified by his crew, the job’s foreman called KGTV, the local ABC television affiliate. Word soon reached arkology researchers from University of California San Diego, who arrived the following morning. The Maddox Ark appears to contain the personal effects of a young girl named Maggie Maddox. Within the Ark, a child’s backpack, tagged with official Pacific Zone markings, was discovered. The backpack in turn contained a folder with school work; a coin purse with a resident card, currency, and a keychain; a food canister; and a small toy. Two pencils and a rubber eraser were also found. Locations pertinent to the Maddox Ark. 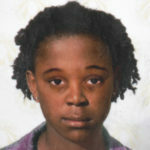 Photograph of Maggie Maddox from her Pacific Zone resident card. The Ark containing what appears to be Maggie Maddox’s personal effects provides little in the way of identifying details. Her Pacific Zone resident card, however, offers basic information. She appears to be a girl of eight living in the city of Lancaster, in what is today’s California high desert. Other artifacts in the Ark – namely her school folder and keychain – tell us she lived with her mother and may have had an older brother. The Ark’s discovery, some 170 miles away from Lancaster, raises more questions than it answers. Though theories abound,b-d arkologists disagree about her ultimate fate, why her effects surfaced so far from her home, and why in fact they were collected in the first place. The last date mentioned in the Ark, October 27, NE26, pinpoints the objects to that time period. Events beyond that point are a mystery. 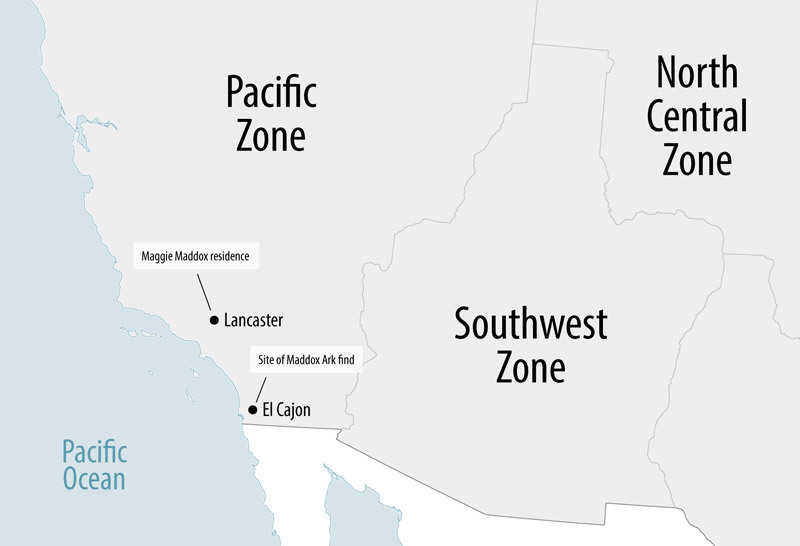 While it did not contain the revelatory artifacts of the La Costa or Eureka Arks in respect to Pacific Zone scholarship, the Maddox Ark nevertheless expanded our understanding of the lives led by children in the Zones. The folder in particular provides a glimpse of an educational curriculum and childhood culture that changed the face of U.S. arkology. Researchers have drawn upon the artifacts in the Maddox Ark to fill in holes regarding the Pacific Zone border, the cultural impact of the Pacific Zone’s “disappeared,” and the synergies between twinned imagery in the Pacific and Great Lakes Zones. a Nevins Z, Jacobs RT, Maquena JS. Seeing the Pacific Zone through a clearer lens: The Alhambra Ark in context. Foresight. 2003. 11(2);73-82.
b Fujimoto CK. Tracking the Pacific Zone’s “disappeared” population. Liminal. 1999. 5(2);291-305.
c Carlin P, Thessaloniki MG, Truman EH, et al. San Diego and the center of insurgency in the PZ. Pandora. 2011. 10;1225-1239.
d Breier EM, Dross KZ, Cushing JJ, et al. Suffer the children: Forgotten youth in the Zones. J Arks and Society. 2012. 4(1);234-242. <sup>a</sup> Nevins Z, Jacobs RT, Maquena JS. Seeing the Pacific Zone through a clearer lens: The Alhambra Ark in context. Foresight. 2003. 11(2);73-82. <sup>b</sup> Fujimoto CK. Tracking the Pacific Zone’s “disappeared” population. Liminal. 1999. 5(2);291-305. <sup>c</sup> Carlin P, Thessaloniki MG, Truman EH, et al. San Diego and the center of insurgency in the PZ. Pandora. 2011. 10;1225-1239. <sup>d</sup> Breier EM, Dross KZ, Cushing JJ, et al. Suffer the children: Forgotten youth in the Zones. J Arks and Society. 2012. 4(1);234-242.